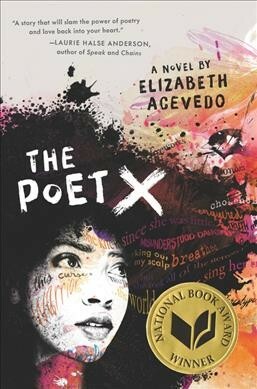 The Poet X is a marvelous novel told in poetry form where Elizabeth Acevedo narrates the story of a silenced young woman, Xiomara Batista. This novel addresses the issues of racism, sexism, and the importance of self-defense and having a voice. In this story, Xiomara battles the expectations of society and family. She uses poetry as a secret way to tell her narrative, and to share and express her most inner struggles. In the novel, Xiomara is expected to be the ‘perfect’ daughter, but she finds that hard to accomplish and unrealistic. She believes that no matter how much she tries, it will never be enough to her mother. She is expected to be religious, but finds that her thoughts do not coincide with the prevailing beliefs of the church. Although forbidden to date, she falls in love and finds someone that supports her rebellious beliefs, passion for music, and most importantly, someone who is willing to listen to her poetry. She feels that she has been heard. Throughout the story, Xiomara struggles to find and keep her voice. She often comes into conflict with her mother, but through all of the ups and downs, she finally comes to an understanding, realization, and compromise with all that is expected of her. Even if you are not a huge fan of poetry, this is still a book you should check out. Acevedo’s writing is truly inspiring and emotionally compelling. As a reader, I responded and empathized with Xiomara’s emotions. The free-verse poetry delicately conveys the story and the messages behind it. This novel is indeed about the fight for a voice and rights in society. Xiomara’s struggles are present in real life, and that is what makes this book so relatable. Acevedo’s writing expertly highlights a need for this fight and what we can do for those who are struggling to find a voice. I really loved this book, and it rightfully deserves a 4.5 out of 5 stars.